Plugin Cleaner – deleting Internet traces, Windows tracks and program traces. Support for over 700 plugins. 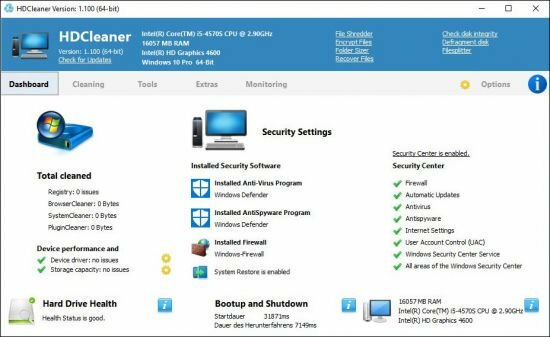 Registry Cleaner – Cleans registry, eliminates errors and optimizes the performance of the computer. NOTE: The settings made are applied to the "1-Click Maintenance and Automatic Maintenance"
AntiSpy – disable settings in Windows, which will autonomously contact the Internet. Backup & Restore – complete backup and restore the registry .. Wipe files and folders, wipe free disk space, wipe complete partitions or complete drives with Pseudorandom Data, US DoD 5220.22-M (8-306. / E), US DoD 5220.22-M (8-306. / E, C and E), Schneier’s 7 pass or Gutmann 35 passes. Windows 10, 8.1, 8, 7, Vista and XP. Including both 32-bit and 64-bit versions.